Evacuation diagrams shall be displayed in all facilities. 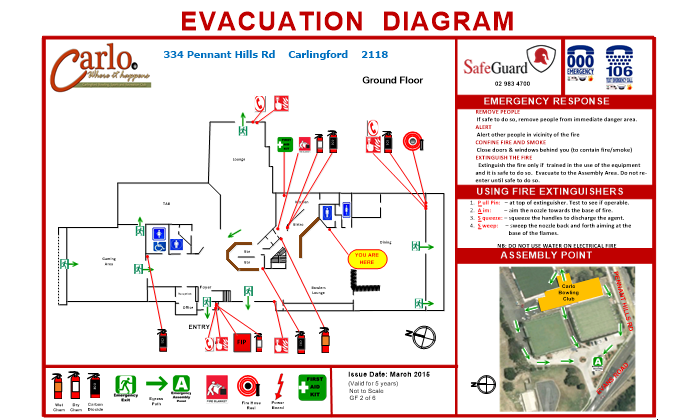 Evacuation diagrams shall be displayed in locations where occupants and visitors are able to view the diagrams. Evacuation diagrams shall have the correct orientation with regard to the direction of egress and its location to the “YOU ARE HERE” point. A pictorial representation of the floor plan or area, which shall be at least 200 x 150mm. The ‘YOU ARE HERE’ location. The designated exits in the facility shall be green. Warden intercommunication points (WIPs) and Manual call points (MCPs) shall be red and emergency call points (ECP’s) shall be coloured white or have a black border. Hose reels, hydrants and fire blankets shall be red. Fire indicator panel (FIP), if provided. Location of assembly area(s), either stated in words or pictorially represented. A legend, which shall reflect the symbols used. Emergency information (telephone numbers, emergency response procedures, fire orders, warden details, North, first aid stations and kits, hazardous chemical store and spill response kits) are shown; the minimum size of the evacuation diagram shall be A3, and the minimum size of the pictorial representation of the floor area shall be A4. Every facility shall have an Emergency Plan, Emergency Response Procedures and related training. This must be developed, implemented and maintained by the Emergency Planning Committee. Our Evacuation Diagrams and layouts can be customised to reflect an elastically pleasing finish, incorporating your company logo and meet all regulatory requirements. We have competently qualified consultants that can visit your facility to identify and mark out locations to fighting equipment, exit paths, assembly areas and locations to place diagrams.